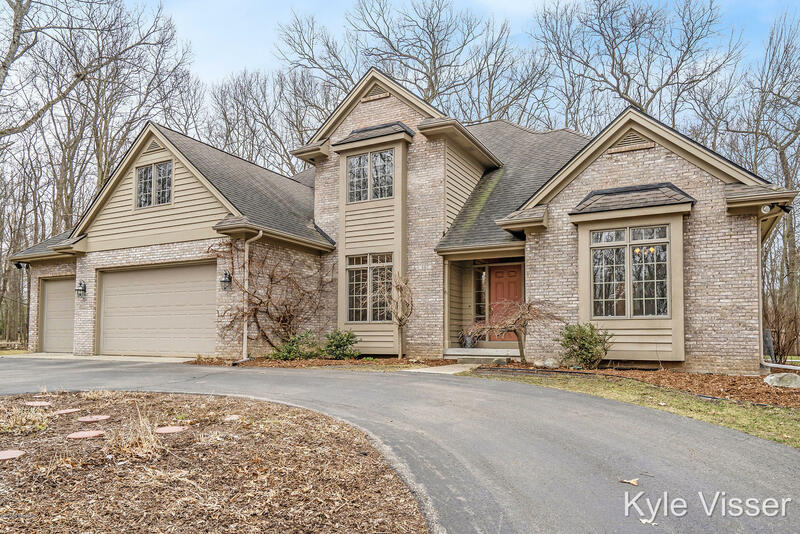 This beautiful Ada home in Greentree Farms is nestled among the trees on a secluded lot. There is a spacious, eat-in kitchen with hardwood floors and plenty of storage space. The main floor laundry and half bath are conveniently located between the kitchen and the entrance to the garage. The great room offers plenty of natural light with it's large windows and soaring ceilings. A double-sided fireplace connects the living room and cozy dining area in the kitchen. The spacious master bathroom hasa five-piece en suite and a large walk in closet. The second floor boasts three good sized bedrooms and a full bathroom. There is a bonus space above the garage that is unfinished but would make a great playroom or media room. This home has an unfinished basement as well with high ceilings for room to expand or just for additional storage. All just minutes from the revitalized Ada area and in the Forest Hills School District.